It's no secret that I have a thing for baking with nuts. I owe it all to a now seemingly long-ago attempt at the low-carb dieting, which I was actually following when I first started this blog as evidenced by some of my earlier recipes. I've always loved to bake, but flour-based treats were prohibited if I wanted to stay on track, so I threw myself into researching alternative flours. This introduced me to the amazing world of almond meal and coconut flour; things which I still use quite regularly today. Atkins is a thing of the past for me right now (though I may take it back up come wedding dress fitting time! ), but I'm glad that because of that experience I was able to expand my baking (and cooking) repertoire to work with ingredients that I may have otherwise totally ignored. My successes with almond flour led me to hazelnut meal which encouraged me to experiment with macadamia nuts and pecans, and soon almond paste (which is not the least bit low-carb, but which makes cakes incredibly moist). One afternoon a couple years ago, I stopped by Whole Foods to pick up some almond paste for a batch of Italian Rainbow Cookies, and noticed a row of Pistachio Nut Paste cans lined up just above. My brain started whirring and I impulsively tossed a couple of them in my basket (ignoring the $11 Whole Foods price tag). 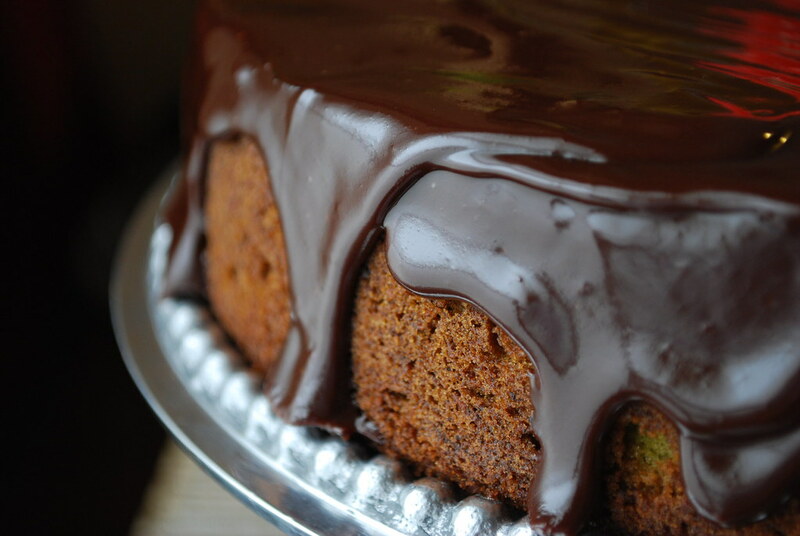 That night, I baked a three-layer pistachio cake filled with chocolate ganache and topped with white chocolate. It was gorgeous (think layers of green, black, and white--so pretty!) and tasted even better than it looked. Since then, I've been wanting to try out more recipes using pistachio paste, but had a hard time justifying the steep price tag. So I decided to make some myself. I ordered a bag of bulk raw pistachios and subbed them for the almonds in my homemade almond paste recipe. Much to my surprise, it worked! I used a portion of the homemade pistachio paste to create this cake, which is a bit more modest than the one I previously described. I also added a bit of rosewater for a slightly Mediterranean feel, though this is absolutely optional (replace it with vanilla extract if you prefer). 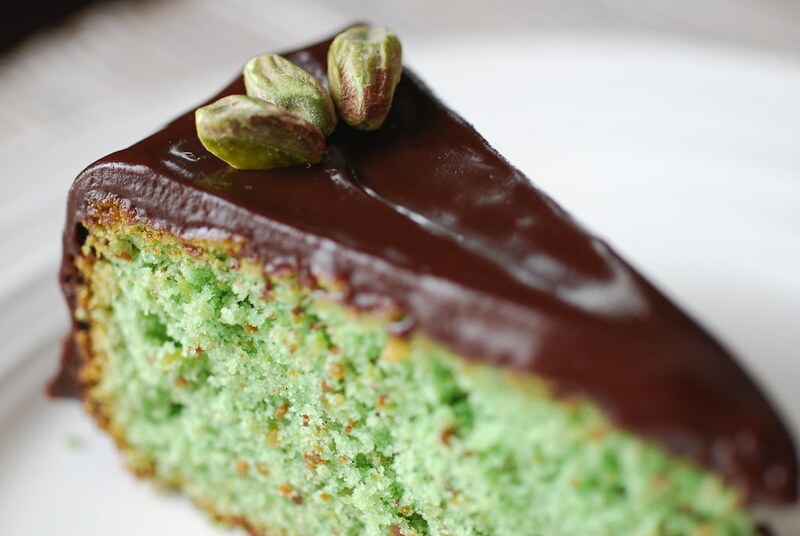 Topped with a rich dark chocolate ganache and a few salty roasted pistachios, it's a lovely afternoon cake that takes little effort to make, but which looks absolutely gorgeous on the plate. Tip: I used homemade pistachio nut paste for this recipe (as described above), but I've also had no trouble finding it (by a company called "Love n' Bake") at my local Whole Foods. It's about 10-11 dollars there which is quite a bit, but you can also find it for a bit less on Amazon or from my favorite baking supply store NutsOnline.com. If you have any questions about this, just ask me in the comments; I'm happy to help! Prepare your pan by buttering and flouring. If using a regular cake pan (not a springform) I suggest adding a round of parchment paper to the bottom to prevent sticking. Preheat your oven to 350 degrees F. In the base of an electric mixer, cream the butter and sugar until fluffy. About 5 minutes. Add the eggs and continue to beat for 3 more minutes. Add the pistachio paste, almond extract, and rose water and continue to beat until combined. In a separate bowl, sift together the flour and baking powder then slowly add to the pistachio paste batter and mix until just combined. 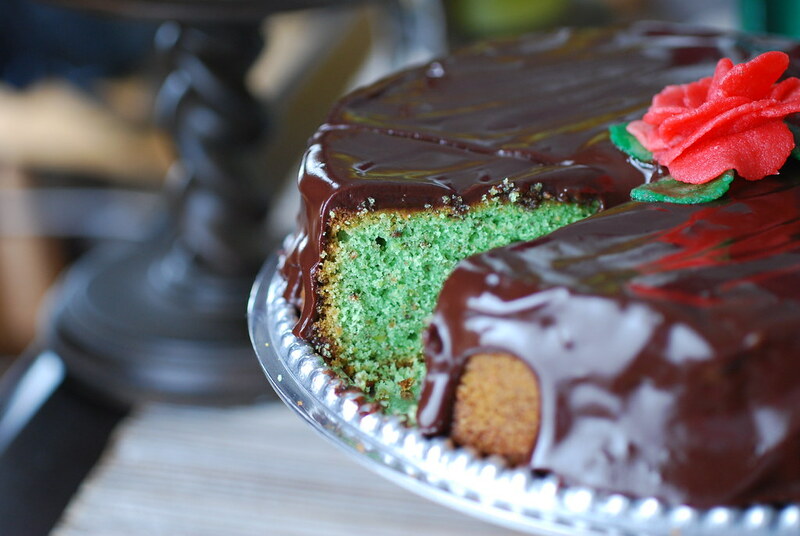 If using food color, add the green food color and fold in until evenly distributed. Pour the batter into the prepared baking pan and bake in on the center rack in the preheated 350 degree oven for approximately 40 minutes or until a tester inserted into the center comes out clean. Remove from the oven and let cool for 5 minutes, then turn over onto a cooling rack and let cool until it reaches room temperature. While the cake is cooling, prepare the ganache by heating 1 cup of heavy cream in a small saucepan just until bubbles start to form around the edge. Turn off the heat and pour over the chocolate in a large bowl. Stir continuously until melted completely and smooth. Let cool. Also prepare the syrup: combine the 1/2 cup water and 1/2 cup sugar in a small saucepan over medium heat, stirring until the sugar fully dissolves. Remove from the heat and let cool. Pour in the amaretto and set aside. 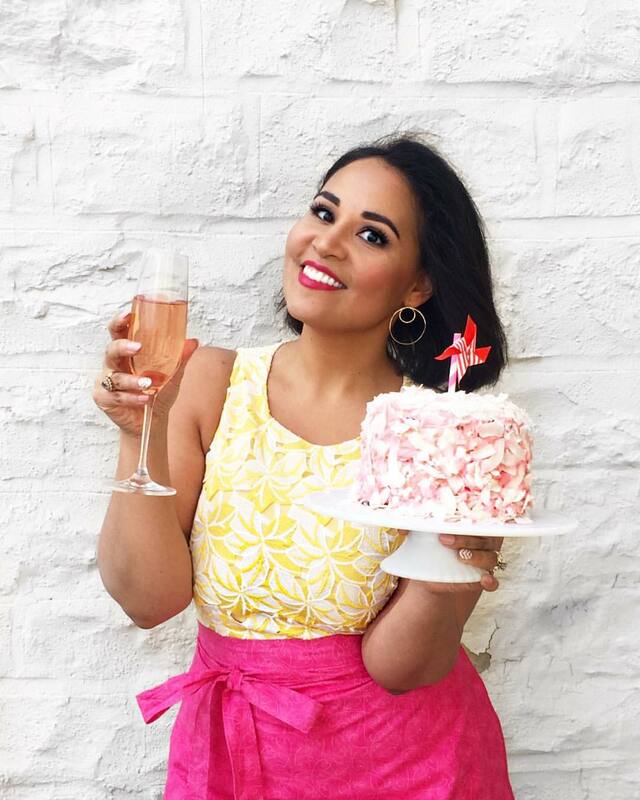 Once the cake is cool, use a pastry brush dipped in the amaretto syrup to brush the top and sides of the cake several times, allowing the syrup to absorb. Place the cake on the serving dish and tuck slices of parchment paper under the cake to protect the dish. 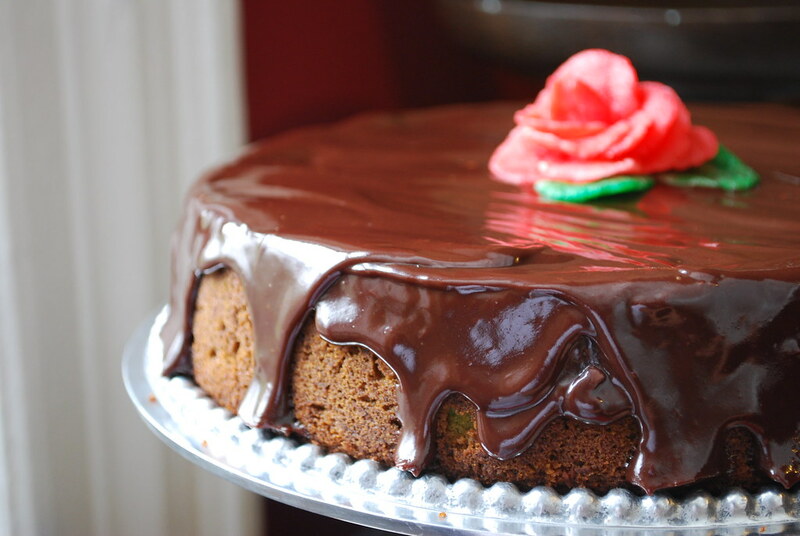 Pour about 1-2 cups of the ganache over the cake. Garnish with pistachios and marzipan flowers, if desired. Let cool for 2 hours, or until the ganache thickens. Gently slide out the parchment paper pieces from under the cake and serve.